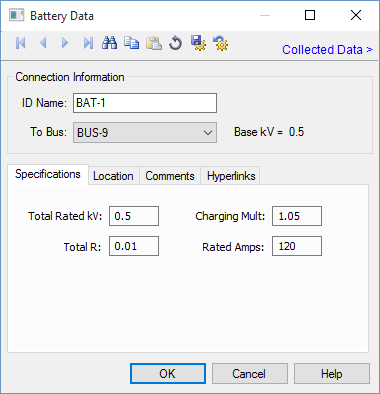 For batteries, the program automatically assigns the names BAT-1, BAT-2, BAT-3, and so on. To Bus This is the ID name of the bus to which the equipment is connected. The base kV of the bus is indicated on the right. Total Rated kV This is the total voltage rating of the battery string. Charging Multiplier This is multiplier for the battery voltage reflecting the charge condition. For example, a fully charged battery could have 1.05 and a slightly drained battery may have 0.95 as the charging multiplier. Total R This is the internal resistance of the battery string in ohms. Rated Amps The rated amperes of the battery or battery string. Most batteries typically have the ampere-hour rating on an 8-hour basis. The nominal amp rating is the ampere-hour divided by 8 for such batteries. If the battery rating in ampere-hours is given at a different discharge duration, then divide by the stated number. Note: Batteries are modeled as a straight Thevenin voltage source behind a resistance. They HOLD voltage behind an internal resistance like a swing bus. Batteries have the ability to be the single source that enables a system to enter power flow and solve the system.